Click an image to learn more about each product. Since 1st August 2009, Côtes de Gascogne has been registered as an Indications Géographiques Protégées (IGP) and as with all IGP, the production conditions and standards are defined by an official decree and specifications defining the production conditions and the standards to be respected (production zone, varieties, vinification, yields, analytical standards, etc.). In addition to controls related to production conditions and with respect of analytical standards, all IGP Côtes de Gascogne are taste controlled by the Organisme De Gestion (O.D.G) that relies on a trained panel of experts. 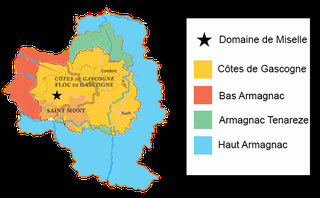 The Côtes de Gascogne region is in the heart of the Armagnac region, as such many vineyards producing wines also produce small batches of Armagnac, often for local consumption. Domaine de Miselle is located in the part of the region that overlaps with the Bas Armagnac producing region. Domaine de Magnaut is located in Armagnac Tenareze.